Fabric Mart Fabricistas: Made by a Fabricista: Soft Cotton Voile Open Back Sundress! Made by a Fabricista: Soft Cotton Voile Open Back Sundress! Hey, all! I love summer, and I love sundresses. Many of you have "known" me for a few years, and this will come as no surprise to you. LOL. When asked what I wanted to do for July, I knew EXACTLY what I desired to make, this Burda dress (August 2014, style 116) with this gloriously soft Amy Butler yellow/green/blue peacock feather printed cotton voile. I envisioned walking in a field of wildflowers with a slight wind blowing my wide skirt. Now, in reality, I'll likely just wear it out to dinner or to a party here in town, but if I ever do get a chance to walk in a field of wildflowers with the wind gently blowing, I absolutely will wear this dress. The dress pattern features a lovely open back, but because of the elastic (it also features a tie, but I omitted that for a cleaner finish), it is still fairly conservative, as the elastic cinches it up to a demure sized hole. I may increase the length of elastic by an inch for my next make of this since it is a perfect fit as is, but it pulls a bit on the front skirt. Nothing really noticeable, but enough for me to wish for a bit more ease next time. I do really adore this back fit since it is rare for things I make to fit exactly right at the small of my back (with my short back length and swayback, things I make always wrinkle at that spot). If you need to wear a bra, this open back is created for you. The silhouette itself is also very well thought out, with a longer back hem where all the skin is peeking out, and the front hemline is a bit shorter, to contrast the more conservative styling of the front bodice and skirt. The original dresses in the Burda magazine were made with silk and other floaty fabrics, but I really do love it with this voile, and think it would be just glorious with a pretty Liberty lawn, as well. If you want to try this pattern out, the Russian Burda site has some beautiful examples of this dress being made in a whole host of fabrics. It was also made by Kathy, one of the Fabric Mart Fabricistas, a few years ago. I love her take on it with the Rayon challis. A few things I want to point out about construction are photographed above. Above left, you'll see how I ended up having to apply the 1/4" elastic to the waistband. It is meant to be enclosed by the seamline of the waist, but because I made pockets (they are pulled from a Butterick skirt pattern), the seam was too bulky through that portion of the waist seam to pull the 1/4" elastic through. I was frustrated, but just attached it over the casing using the stretch, pull, and zigzag stitch over the elastic. Below left, you'll see how much nicer the back facing casing looks in contrast. I even was able to use a thicker elastic through there (3/8") and it really does look very neat and tidy. A note on the lining...I thought the lining extended the whole amount of the pattern, but the reality is that it is only needed in the bodice. It was very easy to line the top, and I left the shoulder seams open so I could have a nice clean finish on the neckline and armscye. I then folded the back seamline in on the shoulder seams, and gently placed the front shoulder seamlines into the back portion and topstitched the seams closed there. Since I absolutely loathe hemming armscye hems when they are this tank/kimono style sleeves, I think I will try this type of lining more often in the future. The lining, btw, is a tan voile from Fabric Mart. It is perfection for lining summer garments, and is as equally soft as the Amy Butler voile. Yum! The one I used is sold out, but this grey is a good option for a neutral that can be used to line garments. Two more views for you all. I chose to make the 38 throughout, though I am definitely not a 38 at my hips. (I usually wear a size 42 in my pants/skirts in Burda.) 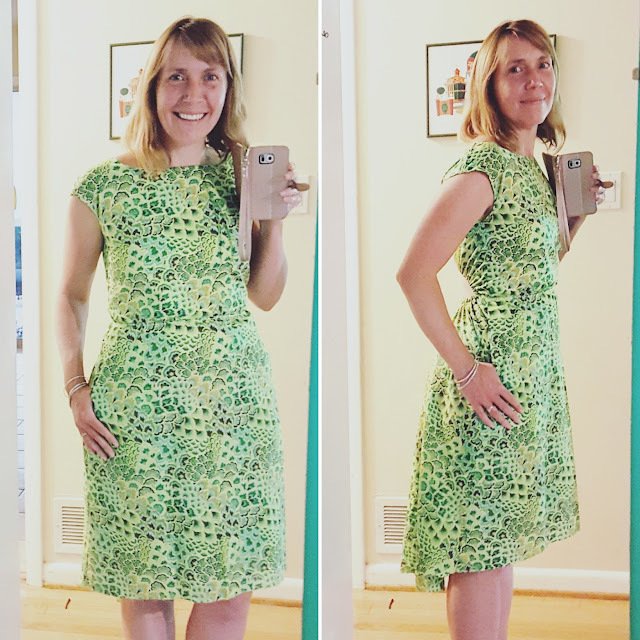 Because of the very very full skirt, I figured I could wear the 38 with no issues, and I was right, it fits great, and there is plenty of room at my hips and thighs for comfort. If you don't like the hi-lo hemline, I would suggest increasing the front length by a couple of inches and decreasing the back by a couple as well. You will have to straighten the hem out since it does have a curve to make the hi-lo happen, but that shouldn't be too difficult. I'll end with this shot, though it is a bit goofy. It's an unintentional action shot and it shows how nicely the fabric and dress pattern moved together when I was walking. This is the rare dress I'd rather have people see me from the back before they see me from the front. Have any of you tried this pattern? How about the beautiful voile from Amy Butler? I hope you all are having a wonderful July, and I'll see you back here in August! Beautiful dress, Dina! Very flattering on you from both front and back. That fabric is really lovely. Gorgeous summer dress! Cool looking and I'm sure to wear as well. Gorgeous Dina! I love this pattern every time I see it. And I just bought 4 yards of voile recently because it is *THE* best lining for summer dresses!! Looove it, Dina! I've been meaning to make this one for ages. I always seem to get distracted! Thanks for leaving a comment! All comments are reviewed before posting to help us eliminate spam. Your comment will be posted within 24 hours. 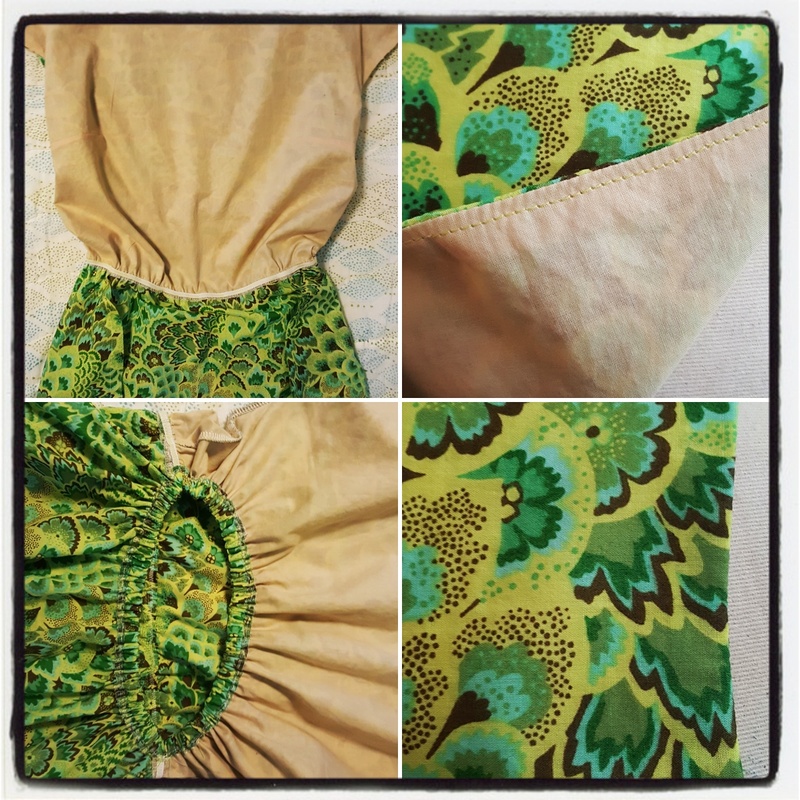 Made by A Fabricista: Sewing Up Leftovers!